I just knew you were going to mention the ladder. There's just something magical about that part of the truck! That's a super cute truck. I like that it has "storage" in it, too. 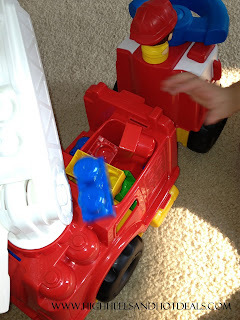 My son has this and he plays with it every single day. I love that truck!! The boys would love it! Very cute! Maybe I'll get it for Nick for Christmas. 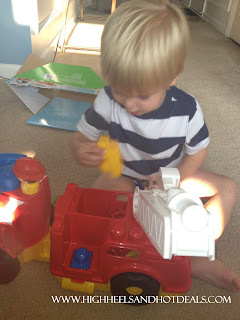 He's really into firetrucks. He gets so excited when he hears one now. 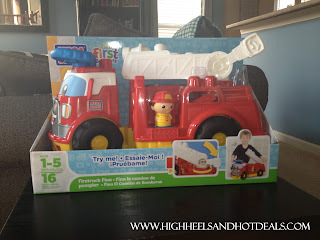 Very cute, firetrucks are always popular with kids! aww it looks like he really likes it! That's a cool truck! I'm glad he had fun! My son would love that!! He's obsessed with fire trucks. This is adorable! Adding to Christmas list for nephew! 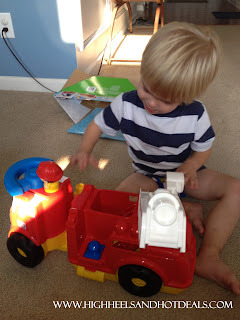 There's something special about a little boy and his first firetruck. Fire trucks are just such fascinating things to little kids and Mega Blocks ones I bet are even cooler. 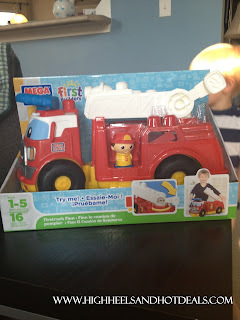 My boys would have loved this when they were younger. My nephew would love this, will be putting it on his holiday list. Thanks for the review.